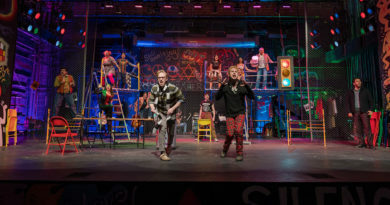 Last October, a 30-year-old dream was finally realized at the Josephine Theatre with the premiere of Paradise City, a rock opera created by music veterans Ricky Hernandez, Richard Rosen, and the late Tito Villalobos Moreno. 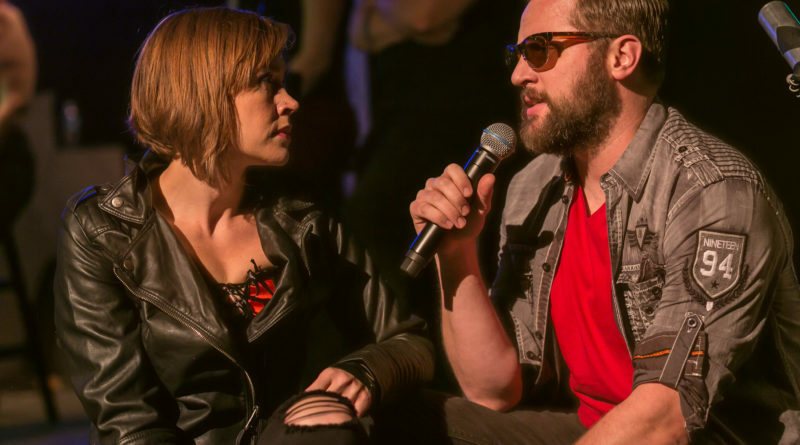 Originally written in 1984, the piece is finally seeing the light of day, thanks to the dedication of the creators and performers, all of whom are part of the San Antonio music and entertainment industries. It tells the tale of a rock band named Jimmy and the Heroes, whose members make their way to the titular town where everyone is promised complete freedom and indulgence. As such things go in these fables, they quickly discover that all that glitters is not necessarily gold. 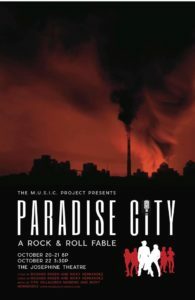 Inspired by the rock operas and concept albums of the 1970s, Paradise City features a completely original score performed in varying musical styles. Mr. Hernandez and Mr. Rosen along with the show’s co-producer and co-star, Bekah Kelso, offered some insight about the production and its history. What was the inspiration behind the creation of Paradise City? 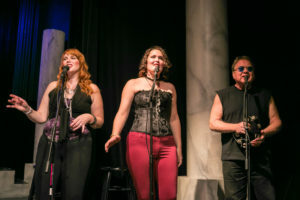 Left to right: Shannon Earle, Alyssa Rogers and Dubby Hankins (photo: Danscape). RICKY HERNANDEZ: In 1977 or so, I began working on a rock opera version of Pinocchio. Richard was working on an adaptation of a Bertolt Brecht/Kurt Weill opera called The Rise and Fall of Mahagonny. We decided to try to morph both shows into one. However, we were visualizing Pinocchio not as a little boy, but as a 19- or 20-year-old. In the fairy tale, he becomes a real boy, so we thought, “Let’s visualize him at a later age and see what happens.” Eventually we dropped the Pinocchio idea and went with our story. But they’re similar, nevertheless — a young man on his journey. RICHARD ROSEN: Ricky had already composed a couple of songs, and I got inspired by the idea. I got really excited about doing a show that showed how difficult it would be for that little boy to become a man. We all believed that the concept of musical theater, using a rock idiom, would work. This was originally envisioned as a film script, correct? What made you decide to transform it into a stage show? ROSEN: I had been writing film scripts for a while and Ricky was a musician/composer who loved film. We felt the piece needed the larger palette that film will allow. As we began to write, we found that the visual aspects of the play we were creating needed the pace and vision of film, allowing it to break through traditional theater. HERNANDEZ: I felt it would be easier and cheaper to get it up on stage than it would be to find a producer to make a movie out of it. The movie with the script we had would have been really expensive. I had seen a DVD of the 10th anniversary of Les Miserables. It was done in a concert format, so that gave me the idea of staging our show that way, like The Who’s Tommy or a Pink Floyd show. It just felt like it would be a lot less expensive if we could pull it off that way and still tell the story. Apparently, it worked. The audiences at all the shows were commenting about the story and how much they liked it. For the shoestring budget we had to work with, I think we pulled it off. What were the reasons for reactivating the project after so many years? HERNANDEZ: I had retired in January of 2015, and I did so specifically to finish my unfinished projects. I was actually working on another musical when the momentum shifted to Paradise. Basically, I just wanted to get it done. I hadn’t given up on it; I still believed that somehow I could make it work in 2017. I didn’t know how, but the process revealed itself to me as we got going. ROSEN: Both of us always looked at Paradise City as incomplete. Ricky came over one day and suggested that I work with him to finish the show so we could move on with our lives. That made perfect sense to me, so off we went on another artistic journey with no idea where the journey might take us. How did you secure the funding to get the project off the ground? 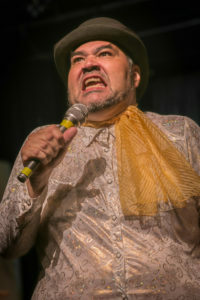 Richard Solis as Mayor Fox (photo: Danscape). HERNANDEZ: Bekah was my co-producer on the production. As I said, we worked together on a shoestring budget to get this show up and running. I bounced my ideas off of her and she contributed by telling me what she liked or didn’t like, as I trusted her instincts to keep me on course. We hit challenges together and solved the problems as we went through the process. I couldn’t have done it without her. In many cases, she led the way. She organized the IndieGoGo campaign and found the nonprofit to present the show. She found the company to manufacture and duplicate the EP. She helped to promote the show on Facebook and found the person to help us with the website. Not only was she there for me as creative support, but also in other areas of what needed to get done. We had no assistants. It was crazy, but between the both of us, we did it. BEKAH KELSO: We’re definitely grateful to The M.U.S.I.C. Project for providing key fundraising expertise and support for Paradise City. How was the concert staging received by audiences? Any feedback to help you make any further adjustments? HERNANDEZ: It was well received. From what I heard, the general consensus was that the sound was good. Some gave great feedback on the performances of the singers and band. The thing about it was that the audience didn’t know what to expect and didn’t know the show, so they had no preconceived notion about how it should be or look like. You know, maybe with a bigger budget we could try some more things, but I would be careful not to mess with the organic simplicity of the production. That might have been what people liked. We were just a rock and roll band telling a story with songs with great performances. Bekah was incredible, Lucas Jack was great, especially since he is used to singing behind his piano; that was his first time doing an acting and singing role. Richard Solis as Mayor Fox was wonderful, as were our chorus members. I told Bekah and director Becky King that the show was telling me what it wanted to be. Maybe a higher-tech light show would be nice? Possibly another musician? 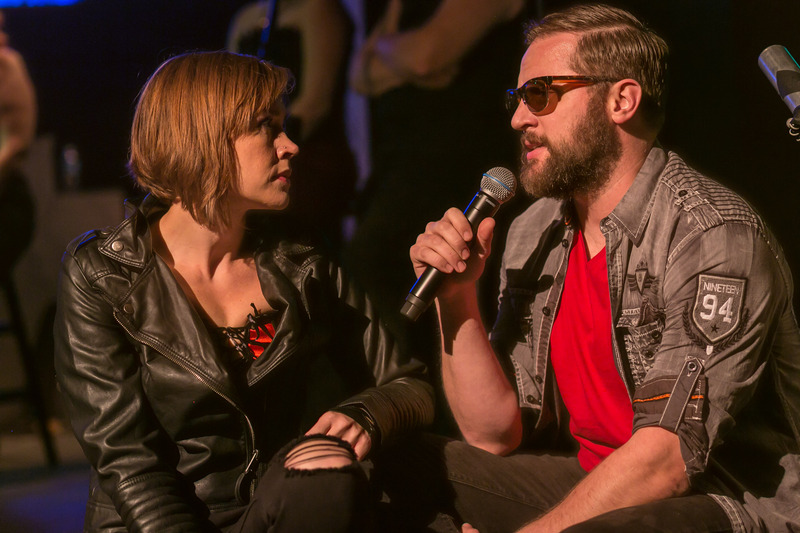 KELSO: I was not sure how it was going to be received, especially since this production existed somewhere in between a rock concert and a rock opera. I was floored to have so many people react so favorably and so enthusiastically, already asking about the next run. I’m sure it has room for adjustment and improvement, but as a maiden voyage, I thought it went exceptionally well. ROSEN: The audience seemed to enjoy the simplicity. Without elaborate sets and costumes, you allow the audience to focus on the performers and performances. The lyrics have to tell the story without artifice. Rock concerts are a modern form of Greek dramas, which uses all elements of time, space, rhythm, shape, and form to tell a story. What do you hope audiences will have taken away from viewing the performance? HERNANDEZ: Obviously, I hoped they would like it but also to be entertained and, as with any show like this, maybe to take something personal out of it. Perhaps identify with the leads, Jimmy and Jenny, and what has life taught them. When people connect with us, that’s where the magic is. 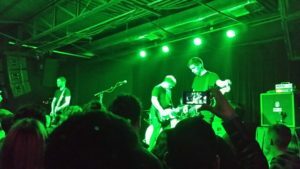 KELSO: I hope they were excited to see fresh, theatrical rock and roll coming out of the San Antonio scene. I hope they left feeling inspired. Considering the piece was written over 30 years ago, are you surprised how it still resonates in today’s political and cultural environment? HERNANDEZ: Ha! When I was working with Richard as Fox on one of the numbers, all of a sudden I realized that similarity with today’s political and social affairs. And that’s great. Who would have thought that 30 years later it would do that? We as humans are slow to learn, so it doesn’t surprise me. Audience members also said what you just asked. I’ll let the show speak for itself. ROSEN: Good music and great theater are timeless. At least that’s what I believe. Watching the show made me see how important it is to appreciate the magic of the human spirit. Tell us a bit about the casting process. How did you find the performers? HERNANDEZ: I was part of Bekah’s band for two years before she decided to step away from music for a while. She had her wonderful baby girl and decided to get into the real estate business. When I began looking for a Jenny, I knew I had to give Bekah first right of refusal. Well, she said yes. That was major, and I was thrilled. I knew Becky King, one of the actress/singers, from my job at Magik Theatre, as well as Ariel Rosen, Cody Asher, and Jovi Lee Gonzales. The process of choosing was really out of my hands. I had to go with who was available and interested. I spoke to three incredible actors to play Fox, but they weren’t available. Finally, I called on Richard, whom I knew from Magik. I knew he would do a great job and I really like what he brought to the character. I had been looking for other singers for the role of Jimmy, but no luck. But then Bekah suggested Lucas Jack, and he said yes, which was awesome. Other singers were referrals from other cast members. One of the amazing things was that people were saying yes without knowing what they were getting into. And it turned out to be a wonderfully talented cast – and great people, too. 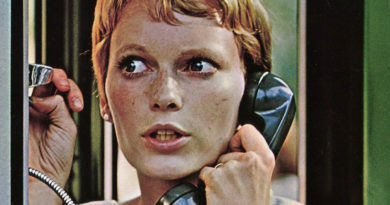 ROSEN: The casting was one of those things that defy all conventional wisdom. Ricky wrote the music with the help of Tito. I wrote the book and lyrics in honor of Bertolt Brecht. It’s like you find someone who would be great but a gig will come along and he or she will have to take it. But then that person calls and suggests a friend to take his place. It’s like bolts of lightning connecting one light or another! Before you know it, you have a cast together, music written, and rehearsal begun. Ricky did the heavy lifting in terms of casting. It was great being able to see my daughter, Ariel, in the show. Lots of connections and audience members with very familiar faces. It’s a family affair, too, right? KELSO: Yes, kind of. Chorus Member/Drifter Ariel Rosen is Richard’s daughter, and Ricky was my stepfather for almost 10 years, from the time I was about five to 15. He remains a cherished part of our family, and he also plays keyboards in our band Bekah Kelso & the Fellas. Where would you like to see Paradise City go to next? If you could produce a complete staging, what would the set look like? HERNANDEZ: Where, next? Hmm. I could joke and say Broadway, but at the same time, after seeing the response and the possibilities, why not? I will say this – I have always thought that Baz Luhrmann would make a great movie of it. You know, his way, like he did Moulin Rouge and Romeo + Juliet. If someone offered me a million dollars, how would I do it? I don’t know. Maybe it’s meant to be just what it is – what it became. Maybe we would polish it up, add a few lights and another musician – a violinist and a cellist. That would be something. For now, I’m going to ask Bekah to help me put together good package that we can send to Baz or New York, and after taking a couple of weeks off, I’m going to start on another musical I have on the shelf. Guess what it’s about? 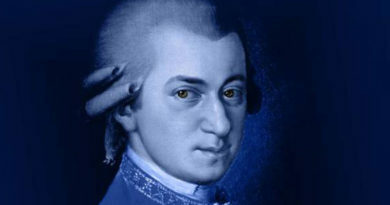 It’s about a piano player – a Mexican-American piano player. ROSEN: I’d love to see Paradise City continue to get better. I think we all learned a lot doing the workshop at the Josephine. Now we have to look at the entire project and evaluate what we learned. Hopefully, we’ll get great feedback and constructive criticism – enough to take Paradise to the next level.